The Diyode CodeShield was developed to make the process of learning code, specifically arduino code, much more intuitive and engaging. The idea is simple: put all the common inputs and outputs on a single board, all hooked up properly. 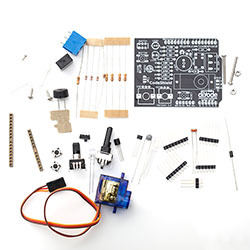 By sidestepping the electronics basics and breadboarding stages of learning (these can come later), we can get new arduino users looking at code within minutes, modifying it right away, and trying new things faster than before. It also eliminates one of the main sources of frustration. Before, when your LED doesn't blink, or your button doesn't work, you have to troubleshoot: 'Did I not hook it up right? Did I design the circuit wrong, or did I write the code wrong?'. The CodeShield allows learners to take the process one step at a time. There is ample documentation to make learning how to use the CodeShield a breeze. The best thing about it in our opinion, is it gives you the ability to not only 'have' a component you want to learn about, you also have a working sample of code that you can hack into your own projects.